A beautifully designed pour-over filter dripper – simple, inexpensive and great! Available in glass with a plastic base (see dropdown for available colors) and white ceramic. The Hario one cup pour-over style cone is designed for efficient extraction. Stirring is not required. The ridges inside the cone are not vertical as with most classically designed manual brew cones but spiral towards the bottom, creating greater turbulence and more even extraction in the brewing process. With the right fine grind it takes approximately three minutes to hand brew 10 to 12 ounces of coffee to perfect extraction. Don't forget the filters! 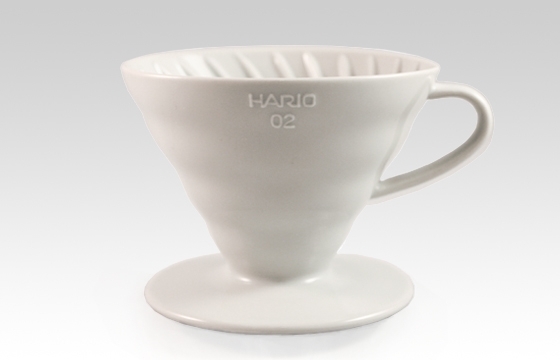 Hario filter are a specially designed conical filter, built to not split at the base.